Jet setter Sam Sparro is in London this week for live club dates, we’re going to the East end of London to see cool design, we’re discovering more undiscovered UK music & Virgin Atlantic Airways are winners in the UK!! London to see cool design, we’re discovering more undiscovered UK music & Virgin Atlantic Airways are winners in the UK!! A quick soundbyte from Tokyo with British rockers Brigade who tell us what they love about Tokyo, London DJ Helen Noir is spinning in Tokyo this weekend, plus Tokyo taiko drumming & Tokyo techno..
An action packed program with The Whip, UK Japan 2008 undiscovered artist Brigade at British Anthems, a UK Japan 2008 event, UK entertainment update, your chance to win a Virgin Atlantic Airways model airplane signed by Fuji Rock Festival artists & learn some Northern & Southern English.. Heading into a 3 day weekend – or whirlwind!! with Swedish DJ & producer Rasmus Faber & his album launch party, Martine Cotton & Dr. Sketchy’s exhibition party, Lightspeed Champion tells us what he loves about Tokyo & more.. 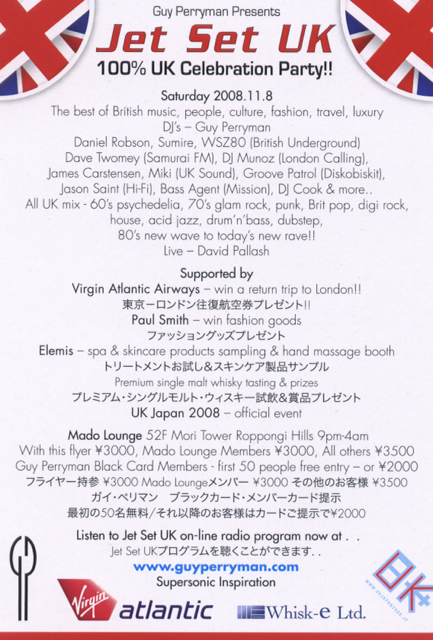 This week we have UK Japan 2008 recommended artist Brigade on the line from London & on the way to Tokyo for British Anthems plus reports from Jet Set UK party & Christmas is switched on in London..
Another fab week in Tokyo & interviews with The Whip, Kierstin Gray, David Pallash & more fun to be had – in Tokyo..
Print this flyer for Â¥3000 entry to the party. And print extra copies for your friends!! Listen to Jet Set UK program (click on the Jet Set Set UK window on the top page) for your chance to get on the party free guestlist!! culture, fashion, travel, luxury brands..
All UK mix – 60â€™s psychedelia, 70â€™s glam rock, punk, Brit pop, digi rock, house, acid jazz, drumâ€™nâ€™bass, dubstep, 80â€™s new wave to todayâ€™s new rave!! Virgin Atlantic Airways â€“ win a pair of return tickets to London!! Listen to Jet Set UK on-line radio program now..
A selection of totally fun, shagadelic cocktail music I could spin at your event. Due to music copyright I can’t put tracks up in full here – so this is not a complete mix but a cut up. Enjoy the trip!! The latest updates about Jet Set UK party – with a message from Sir Paul Smith!! 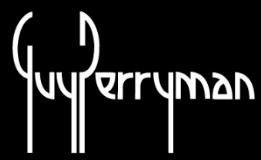 Plus an interview with The Other Boylen Girl film director Justin Chadwick & introducing British Council teachers..
You are currently browsing the GUY PERRYMAN blog archives for November, 2008.